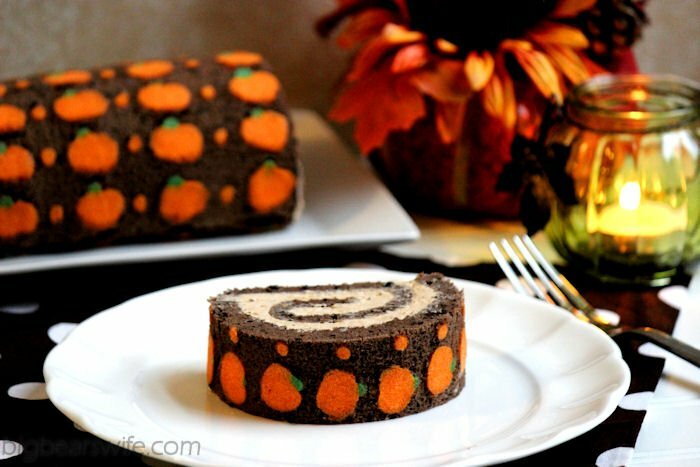 This Chocolate “Pumpkin” Swiss Roll Cake is a chocolate sponge cake that’s been dotted with little orange pumpkins and filled with chocolate buttercream! It’s the first day of Fall! Bring out the sweaters, change the candles throughout the house and start making pumpkin everything! haha. We’re doing the happy dance over here because it’s finally Fall! Our weather has been cooling down and it’s totally putting me into the “Fall” mood. 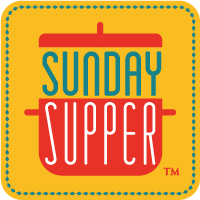 So what better way to celebrate the first day of Fall than with a #SundaySupper dedicated to just that! Our group has brought some pretty fantastic “Fall” dishes for today. You can find them all at the bottom of this post. I know that everything around the “food blogosphere” is getting ready to explode with all things Pumpkin, if it hasn’t already done that. I’ve seen a few pumpkin recipes and I’ve even posted one, but I don’t think we’ve quite reached the whole pumpkin invasion that’s getting ready to hit the internet. So for today, I have a pumpkin recipe for you *surprise, surprise* haha. 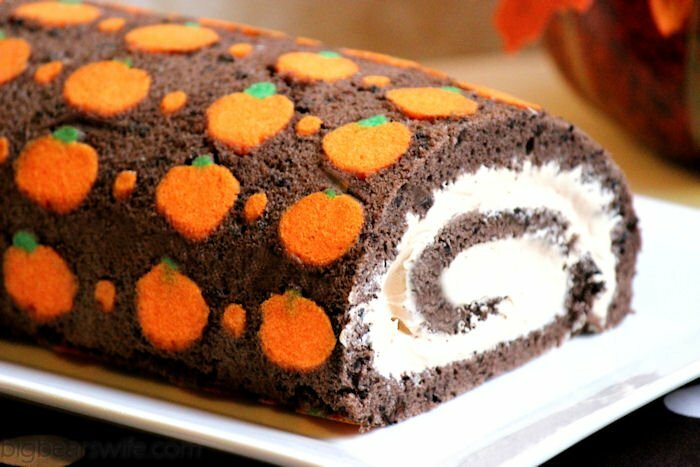 But there isn’t really any pumpkin in this “swiss roll” style cake. It’s just covered in cute little orange pumpkins! I can’t get over how cute this cake is! Those little pumpkins just have me grinning from ear to ear. I know that some people may look at this cake and think “That is way to much work”. But it’s actually very simple and hardly took anytime to make at all. An impressive dessert that’s quick and easy? Yes! *I think it’s “impressive” anyways haha. 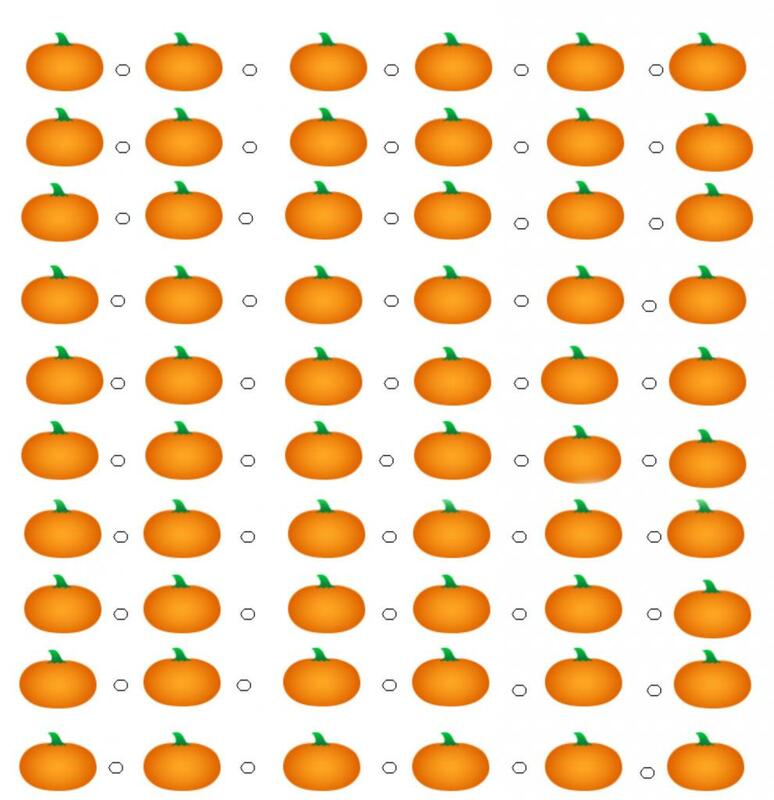 I’ve included a link to the template that I made for the pumpkins. You can get it here. Print that pumpkin template out and place that under the wax paper. Don’t over bake. If you over bake this cake it will crack when you try to roll it. I baked mine for 7 minutes. For my Filling I combined a can of cream cheese icing and a can of caramel apple icing in the bowl of a mixer and whipped them together on high for 2-3 minutes. 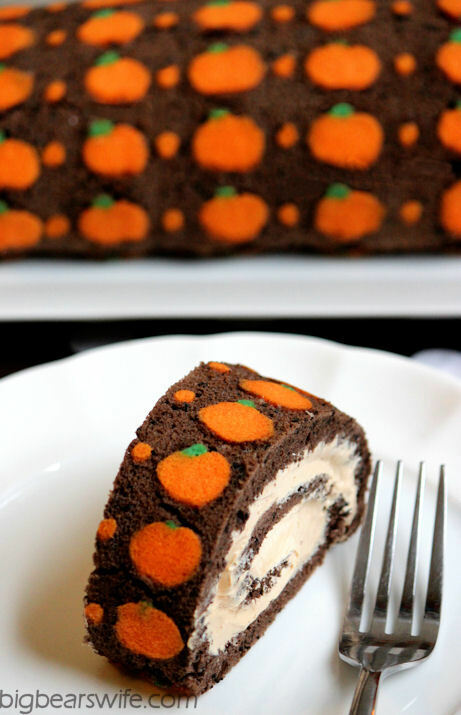 But you could also use the filling recipe on this roll cake recipe (Click Here). Try different shaped and patterns for your cakes! Hearts, Smiley Faces, Clovers, Gingerbread men! The possibilities are endless! Fill and roll the cake while it is still warm! In a medium bowl, mix together 1 egg, 2 tablespoons sugar, 1/3 cup flour and 1 tablespoon melted butter. Mix well. Spoon out 1 tablespoon of batter into a small bowl and tint it green. Tint the rest orange. Lay the pumpkin template onto the baking sheet. Cover with wax paper (or parchment paper). Scoop the orange batter into a plastic sandwich bag. Cut a small hole into the tip of the bag. Following the pumpkin template pipe the pumpkins onto the wax paper. Also pipe the orange dots. Next spoon the green batter into a plastic sandwich bag. Cut a small hole into the tip of the bag. Pipe green steams onto each pumpkin. Place baking sheet into the freezer. Freeze for 20 minutes. While the pumpkins are freezing, make the sponge cake batter. In a medium bowl, whisk by hand the egg yolks and 1/2 cup sugar until the eggs yolks are a pale yellow color. Whisk in the 1/4 cup melted butter. Mix slowly until everything is incorporated. Remove the baking sheet from the freezer and carefully spread the chocolate batter over the pumpkins. Spread the batter evenly on the baking sheet. Bake for 7-8 minutes. Do not over bake. Carefully remove the cooked cake from the oven. Lay another piece of wax paper onto a flat surface. 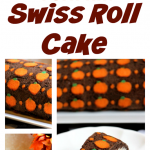 Flip the cake over onto the wax paper and carefully peel the wax paper off of the cake revealing the pumpkins. Flip the cake over again so that the pumpkins are on the bottom of the cake. Spread the filling over the entire cake. 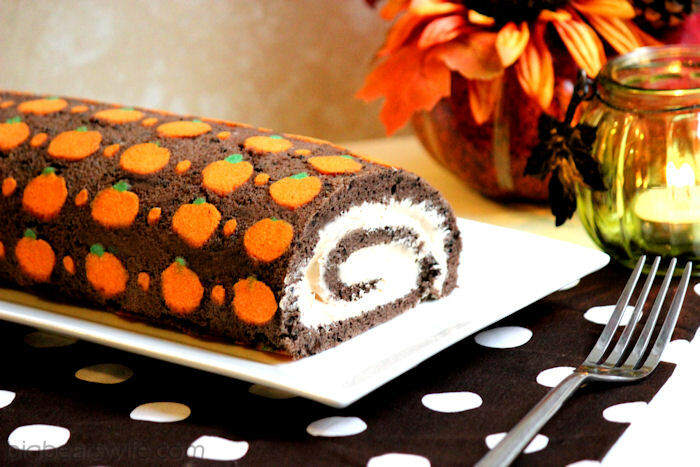 Starting on the edge without the pumpkins, start to roll the cake \"jelly roll style\". Roll until you reach the end. Place the cake on a flat surface with the seam down. Wrap in plastic wrap and place in the fridge until ready to serve. I totally gasped when I opened your post! This cake is so awesome…and creative…and beautiful. Seriously Angie, this cake is just amazing! You have really outdone yourself. OH my gosh! That is soooo cool 🙂 Pinned for sure! omg Angie. 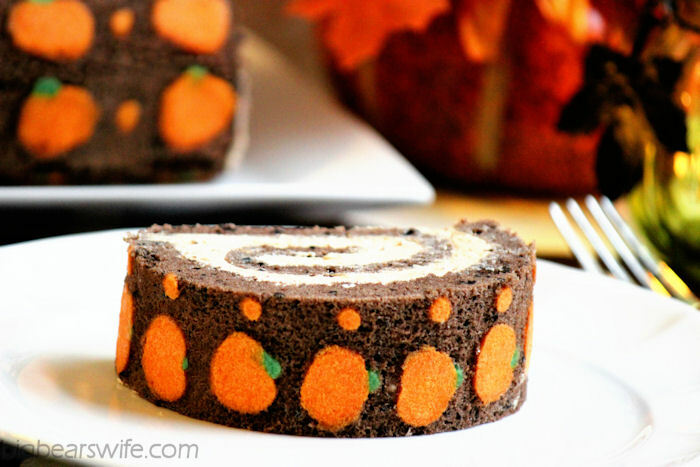 This is the cutest chocolate pumpkin swiss roll I have ever seen in my whole life. That had to be a ton of work, but it’s just adorable! And chocolate and pumpkin? Yes please! Oh my goodness, how adorable is this!?!?! I had never seen a cake like this before and I LOVED reading how you made it. Truly, a beautiful cake! 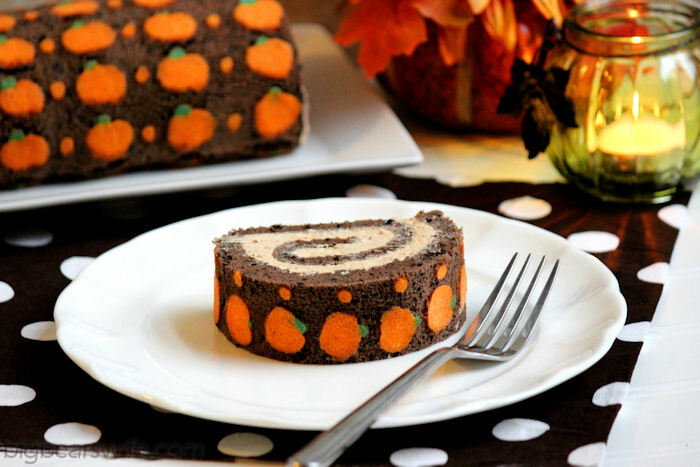 The pumpkin decoration on this cake is adorable! It would be the talk of any Halloween party! Ohmigoodness, this is absolutely gorgeous! I always mess up when I try to make roll cakes, but yours came out so perfectly. Wow Angie, this is brilliant! And the prettiest roll ever. What a lot of work you did for your cake! I love the pumpkin and dots!! Your cake is just beautiful!! Hardly any work at all, it was actually very very simple to make! Maybe (not counting the freezing of the little pumpkins) took maybe 30 Minutes to make? Whoa baby! You are so talented, girrrrrrlfriend! This cake is amazing! SO darn cute, Angie!!! Perfect fall treat! You are so talented. Oh, I can’t tell if my original comment went through. Either way, that’s quite a list and a beautiful looking cake. Bring it on, pumpkin! Very festive. You get an A+ for styling and presentation. I for got to say I pinned it. This, my friend, is INCREDIBLE!! Wow. I can’t imagine all the work and detail that went into this. LOVE it! AWESOME times 10, and then some! So cute! Thanks for the template! This is so cute! I saw you tweeting about it when you were making it and couldn’t wait to see how it turned out. Great idea! This is absolutely gorgeous. Stunning! I am in LOVE with your decorations! What an amazing looking dessert Angie! Thanks for sharing! Oh my gosh, are you KIDDING me?!? This is pretty much the coolest cake I’ve ever seen. My husband LOVES halloween – I must show him this cake. Of course, then he’ll want me to make it, and my piping skills are pretty horrible. haha. Angie, that is SO cool! I can’t get over how adorable this swiss roll is. Best part – you say it was easy to do but it totally looks like a ton of work. You can impress the pants off all of your friends ‘n family 😉 Plus, it must taste as amazing as it looks. This is adorable and looks so incredibly tasty – caramel apple frosting!?! Yes please! Omg Angie this is adorable. I am completely in love with this cake. This is really cute. I did one and it broke when I rolled it. It was pretty warm when I rolled it. Not sure what I did wrong. To bad, the pumpkins were really cute. I’m sorry the cake broke 🙁 I have had them break when I baked them for too long. I found for my oven that I need it to be 400F and I need to bake them for about 7 minutes. Baking any longer will over bake it and it will crack. I would suggest maybe checking it at 5 minutes and if it’s done, go ahead and remove it, since ovens do tend to be different sometimes. This cake seems to be very “temperamental” sometimes. I hope you’ll get to give it another shot. That is adorable. Very impressive! I’ll have to read through your directions again to see how you got the pumpkins in the cake. This idea is great for so many holidays! Quick questions: Are you suggesting rolling the cake warm, right out of the oven? Just wondering if that would melt the frosting Also, what size pan did you bake it in? Yes, you’ll want to roll the warm cake as soon as it come out of the oven (after you flip it off of the hot sheet pan) The cake should be very thin so it won’t be super, super hot like a normal cake. By time I flip mine out of the sheet pan it’s cool enough to handle. What size pan? I have a 15.25×10.25x.75. The template will not fit that. How do you make it bigger? This is just the cutest dessert ever! you say to add in the egg whites twice which one do you do the egg yolks not the whites? This is so adorable! How do you know when the cake is done when you take it out of the oven? If I use a toothpick what should I look for? Also on the 13 x 9 pan, do you cover the whole thing? you can tell by looking at it. It’s a super thin cake so you’ll be able to tell. It’ll look fluffy and sponge like. Also I cover almost all of the 13 x 9 pan with the cake batter. you need the cake to be thin so you can roll it.